Baptism welcomes us into a life of following Jesus Christ. Baptism washes away our sins, incorporates us into the Church and makes us members of the Body of Christ. 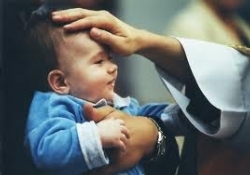 Babies are baptized usually during their first year; however, all who are willing are welcome at any age. Contact the Pastor at 949-494-9701 x111. If the child is over 7 years old and not past 12th grade, please call Gina Stewart in Youth Faith Formation at 949-494-9701 extension 119. Baptism of adults requires entering the RCIA (Rite of Christian Initiation for Adults) program. Contact Donna Beam at 949-494-9701 extension 113.